MGM Las Vegas and many more. Digital Concept is a Franco-American engineering and manufacturing company with offices in Paris and Los Angeles. digital concept is the specialist for card dispensers, motorized card readers, card issuing machines and sim card dispensers designed and created for self-service kiosk integration, where a high level of reliability is required. As a global technology leader in the field of card dispensers, motorized card readers and sim card dispensers we have developed a unique, patented, frictionless mechanism: the concept of operational consistency. 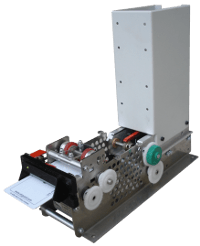 Our card dispensing mechanism allows cards to be extracted more than 2 million times from a hopper without incident, allowing a large tolerance with regard to the processed card condition as well as environmental conditions. The compact design of our card dispensers and card readers (only 10' for the RFID model) allows them to be easily integrated into modern, flat kiosk designs. We welcome you to check out our product line of high precision card dispensers, card dispensing mechansims, card dispensing machines, sim card dispensers and motorized card readers for hotel kiosks, parking systems, loyalty programs, sim card kiosks, mass transit systems, bank cards, telecommunications, bike rental companys, etc. Digital Concept card dispensers and card dispensing mechanisms are in use by world famous brands like Hyatt, Intercontinental/Holiday Inn, MGM Las Vegas, Luxor Las Vegas, ACCOR, FREE Telecommunications, Gunnebo and many more.